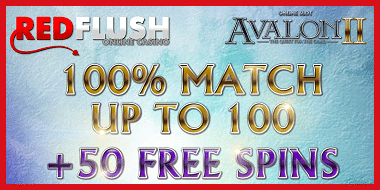 Red Flush gives Top Bonus and 50 Free Spins! 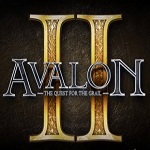 Microgaming’s new online slot “Avalon II” has been published recently in the Red Flush Casino. But that is not the end of the story: new players get now the unique opportunity to play 50 free spins at this fantastic slot. This offer is contained in the welcome package, which includes still more profitable bonuses to ensure players a nice start. Every new casino players get to choose from three different welcome bonuses in Red Flush. You have the option to receive $/£/€ 1.000 in free bets for one hour and whatever you win over $/£/€ 1.000 is yours. Or you take the deposit bonus, where you receive a 100% bonus up to $/£/€ 150 plus the 50 free spins at “Avalon II”. The last one, the “Exclusive Match Bonus”, give you $/£/€ 200 for free for a single deposit of at least $/£/€ 500! Whatever you choose above, you can enjoy the pleasure to take part of Red Flush’s Welcome Package. And that included 50% bonus on your second deposit up to $/£/€100, 25% bonus on your third deposit up to $/£/€400, each 100 free spins for three months plus a free entry in to a weekends free roll slot tournament. Join Vegas Red with an incredible offer! Whoever now wants to join the Vegas Red Casino, gets a fantastic welcome bonus. In the first step, after registering, you receive $/£/€10 for free. No deposit is required. Players must wager the bonus at least 40 times and will be able to withdraw winnings up to $/£/€100! But the list of bonuses and advantages for players goes on and on. All together players can claim up to $/£/€888 bonuses with their first four deposits. Vegas Red doubled your first deposit up to $/£/€200 plus gives you $/£/€22 for free for any deposit over $/£/€200. 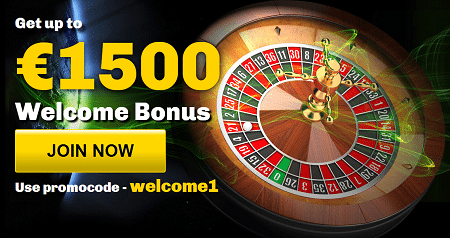 Cash $/£/€200 in and play instantly with $/£/€422! With every of the first four deposits, you receive up to $/£/€222 extra cash for playing. 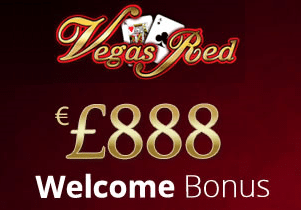 For high roller offers Vegas Red an $/£/€888 welcome bonus in one step. Cash $/£/€1.600 or more in, and you receive straight $/£/€888 on top of it. All players can earn, using the “monthly alternative payment bonus”, extra cash of $/£/€250. You get here up to 15% on top of your deposit, only for using the proper payment methods. Every month.